Everybody loves a good surprise cameo on SNL, even if the formula is pretty well-rehearsed at this point. It’s usually during the cold open, with one of the cast members doing an impression of a celebrity or political figure. Then, the actual celebrity or political figure walks on stage, mugs for the cameras a bit, gets in a good zinger or two, and does the “live from New York” bit. Everybody has a hearty laugh, and the audience collectively agrees that it was good to see this famous person poke fun at their own celebrity status or whatever a little bit. The problem with this setup being so familiar is that it loses pretty much all of its punch when the surprise cameo is, you know, not a surprise. So, if you’ve managed to somehow read this far without seeing a certain celebrity or political figure’s name in the headline, feel free to turn back now so you can properly appreciate the surprise. For the rest of us, The New York Times is reporting that Hillary Clinton will be popping in to remind us all that she exists this Saturday on the season premiere of Saturday Night Live. 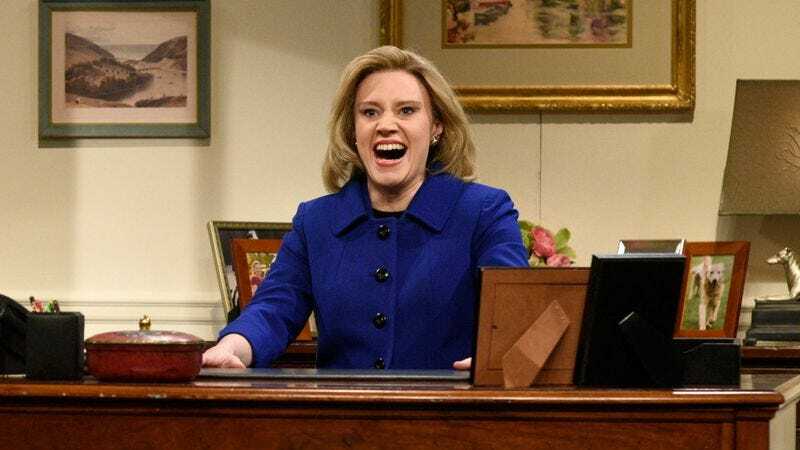 However, The New York Times also notes that SNL’s Lorne Michaels has been known to make last-minute changes to the show, so he could end up pulling the Clinton cameo now that it has been spoiled. Or maybe that’s what he wants us to think, so we’ll actually be surprised when she shows up? Either way, somebody will be on SNL this weekend.